A growing antigovernment movement has drawn a dangerous lesson from the standoff. 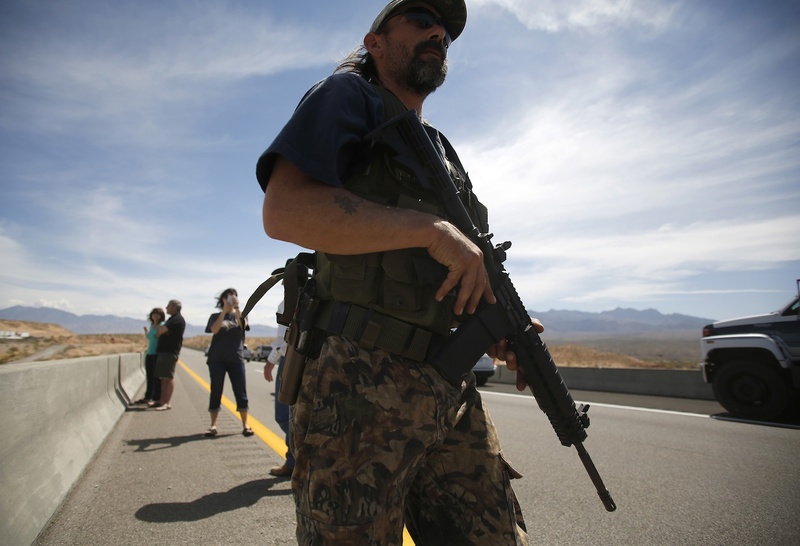 The standoff at the Bundy Ranch in Clark County, Nevada, has faded from the headlines, but a startling report released today by Southern Poverty Law Center warns that the incident may have some long-lasting, and potentially bloody, consequences. Many of the militia members that flocked to the ranch were part of the anti-government Patriot Movement, an extremist movement with a long history but that gained serious steam during the Obama presidency. In 2008 there were about 150 Patriot groups nationwide—and there are over 1,000 today. The SPLC report finds that this reawakened movement has drawn a very dangerous lesson from the standoff, which ended with the Bureau of Land Management backing off and leaving the ranch: a lesson that the federal government can be scared off by heavily armed militias. That’s not to say the Bureau of Land Management should have engaged in a firefight, but the report makes clear the Patriot Movement has been energized by the “victory.” Already, a couple that was at the ranch undertook a headline-grabbing shooting spree in Las Vegas after getting amped for conflict weeks earlier in Clark County. The report highlights several other low-level incidents that haven’t gotten much media attention. 3. “In a low-lying wash where gates held the Bundy herd, an angry, heavily armed crowd grew, defying orders and engaging in a tense game of chicken with BLM rangers in riot gear demanding through loudspeakers that they disperse. They shouted profanities and gripped their weapons.